One of the happiest days for your kids is when you decide to install a fun-filled outdoor playground. Before any of the fun begins, it’s important to prepare your yard for the new addition. The last thing you want to do is build it on an uneven surface or not leave enough room for the kids to swing back and forth. We can’t stress enough how important it is to pick the right spot in your backyard to build your playground. You’ll want to make sure you pick a flat site because even if you build on a slight slope or uneven part of the land, you risk unstable equipment that can lead to accidents. You also will want to know how much space the playground will take up in your yard. Do you want space for your pool, fire pit, outdoor kitchen, kids to play other activities, etc? Recruiting help from professional landscapers in Omaha is a great and smart idea as they can properly level the ground where you want to build and keep the equipment and your kids safe. A playground is a great addition but you don’t want it getting in the way of your other great outdoor features. Rubber Mulch – A popular choice as it acts as a weed barrier and provides a cushion in case any children fall while playing. Plus, it is a very eco-friendly choice. Wood Chips and Mulch – One of the more attractive choices due to the range of color options. Pea Gravel – Affordable option that provides an attractive look and requires low-maintenance. t popular ground covers as it’s affordable and provides a cushion for children but can be hard to maintain over time. Natural or Artificial Grass – Always a smart option as grass brings an attractive, natural look. Natural grass is the hardest to maintain as you need to mow and water properly. With artificial grass, it offers a smooth, flat surface and requires little to no maintenance. The only downfall is it can be costly to install. After you choose what ground cover is best, you’ll want to make sure you keep your ground cover where it belongs. It’s important to create a border around your playground to help establish that this is the designated area for play and that your playground blends in with the rest of your outdoor living space design. A great idea is to create a paving stone walkway or custom patio around the playground. This can help create a weed barrier and if you already have a stone patio, it can seamlessly flow together. Plus, there are many attractive designs and stones you can choose from to enhance the look of your playground and space. 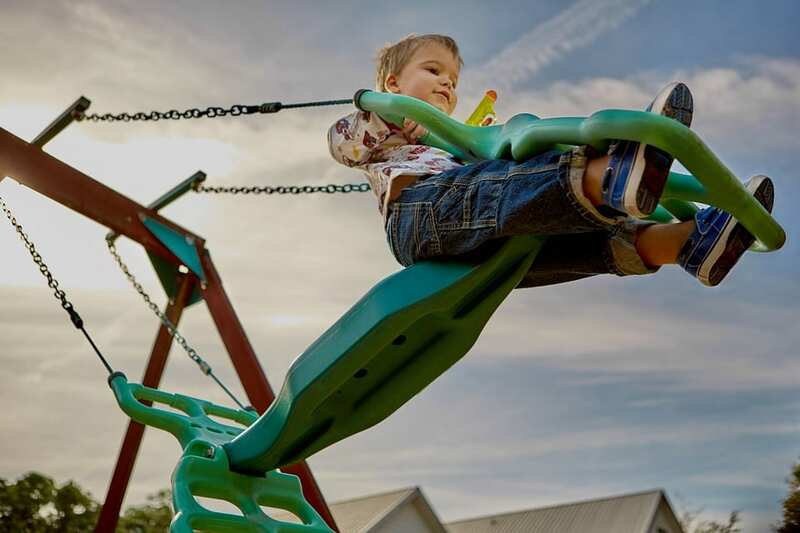 Have the experts at Arbor Hills Trees & Landscaping in Omaha help get you ready to build your playground. Are you looking to add a playground to your backyard? It’s never a bad idea to ask for a helping hand to ensure your space is prepared to house the perfect outdoor playground.